ZPizza's Napoli thin-crust pizza is ideal for roasted-garlic lovers. Twenty minutes early to a nearby appointment, and in the mood for a culinary somethin’-somethin’, I spotted ZPizza at the corner of Tatum and Thunderbird in Phoenix. Actually, I had passed by it many times before but today seemed like a day to experiment. I am quite selective with my pizza, preferring the back-East, New York pizzas with classic sauce tinged with a just-right balance of garlic, oregano, salt, and spice. But since ZPizza does not tout itself as a New York-style anything, I put my expectations aside and asked what today’s slices were. Aside from the cheese and pepperoni standards offered, it was the Napoli that compelled me. A crispy, thin crust holds a rich, robust, almost creamy (though not cream-based) roasted garlic sauce, melted mozzarella and tomato slices which have been seared with texture from a generous sprinkling of parmesan. This flavorful grouping is accented by thick strips of fresh basil, baked into an irresistible fragrance. Yes, I was surprised. And yes, I was impressed. 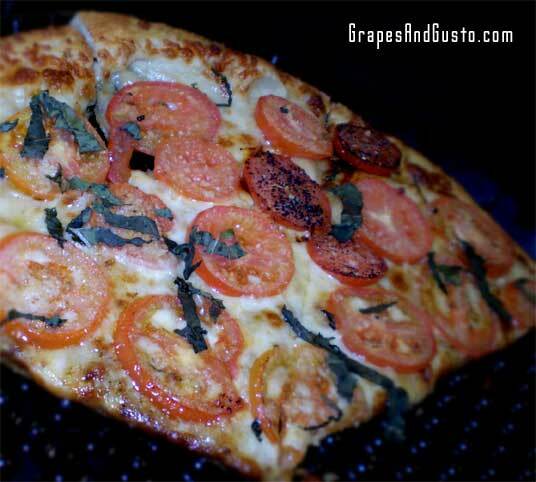 This was garlic with a purpose; basil with strength; and tomatoes –fresh, which I usually do not care for on a pizza – which held their own with their salty parmesan coating. I did not realize that ZPizza uses 100% certified organic tomato sauce and 100% certified organic wheat dough, which is crafted daily and fire-baked on hot bricks. (The definition of “100% certified organic” these days could warrant its own article, but I did touch upon the benefits of organic bread just the other day). Kudos for helping us rationalize that devouring cheesy pizza is now healthy, if not fully for the body then at least for sustaining a hip local business. ZPizza dishes up its pizza with a heart, through its ZCares program. At the time of this writing, ZPizza’s website touts that its 2009 goal is to “give away $4,000 worth of pizza per store in support of community fundraisers.” ZPizza proclaims it opened its first store in Laguna Beach, California in 1986, and has locations nationwide. This is one pizza restaurant that takes its community as seriously as its food. But let’s get back to some of the great pizza flavors offered – after all, who does not enjoy vicarious exposure to new and delicious pizza combinations? Artichoke hearts make a surprisingly frequent appearance on more than one pizza, including the Provence (organic tomato sauce, homemade roasted garlic sauce, mozzarella, artichoke hearts, capers, tomatoes and fresh basil). The Casablanca also comes with that signature garlic sauce, mozzarella and artichoke hearts, but also includes rich ricotta, mushrooms, and parmesan. The cleverly named ZBQ pizza has a BBQ sauce base with mozzarella, BBQ chicken, roasted peppers, red onions, tomatoes, cilantro and – for some starch with your starch – sweet corn. Most of the pizzas are priced around $10 for a small 10” pie, $17 for a medium 14”, and $21 for a large 18” extravaganza. Another pizza category that ZPizza offers is the Rustica pizza ($8.95), which is a free-form, individual pizza, topped here in out-of-the-box combinations. Perhaps the most unusual is the Chicken Curry and Yam Rustica, which includes an exotic mix of mozzarella, curry chicken, yams, mango chutney, raisins and cilantro. ZPizza also offers a variety of salads like Pear and Gorgonzola ($6.50/$8.50), two types of pasta ($7.50), and a wide range of sandwiches, including a Yuppie Veggie Sandwich ($5.95) and a Pollo Latino Sandwich, with marinated lime chicken breast, salsa and avocado ($6.25). If you are gluten-sensitive, ask for the gluten-free crust (where available). And if you are reading my mind, you are now selecting the perfect Chianti to pair with the roasted garlic Napoli you will be picking up to go.